Your wedding officiant is one of THE MOST IMPORTANT components of your entire wedding day. 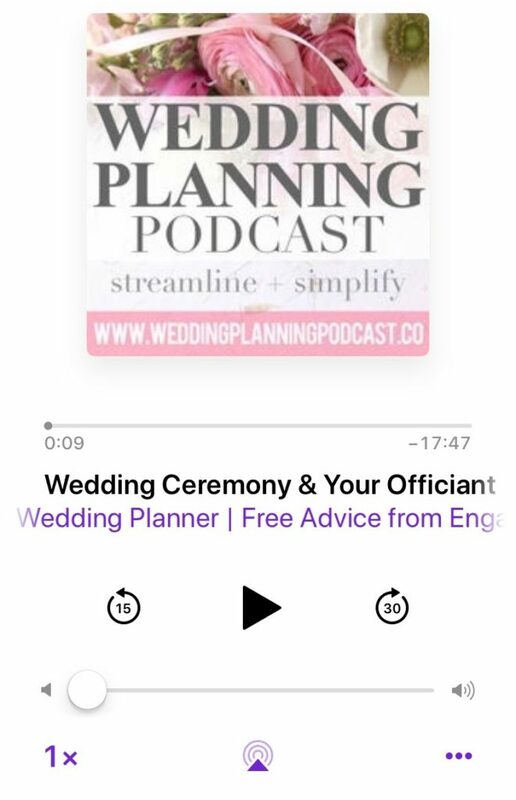 We’re exploring everything that goes into finding the perfect officiant in today’s all new episode of the Wedding Planning Podcast. Tune in here! Who you choose to fulfill this VERY important role is different from couple to couple. Getting married in a church? Your officiant, or “celebrant”, has likely been chosen for you based on the staff at the church. If you’re not getting married in a church, you may have some more creative options at hand for choosing your wedding officiant. You can hire a professional to do the job, or have a friend or family member ordained to perform the marriage ceremony. What things should we look for in our wedding officiant? You & your partner will decide your officiant’s role in the months leading up to the wedding, and the ceremony itself. Therefore, it’s really important to do extensive research and interviews to be sure you choose someone who is compatible with your personalities & vision. We go into this in detail during the full-length audio show. Bethel Nathan is a Southern California-based wedding officiant who is amazingly insightful and warm. I fell in love with her the first time we met, and I think you will too! Bethel outlines the most important lessons she has learned marrying 900+ couples in the past ten years. She shares why it is so important to find an officiant who will participate WITH you in building the wedding ceremony and your vows – versus just giving you a blank piece of paper and telling you to write out what you want them to say. THE CEREMONY IS THE WHY OF THE WEDDING. Bethel also shares her firm position of the ceremony being the WHY OF THE WEDDING. “Grandma didn’t come for the DJ.” SO TRUE. In this respect, your wedding officiant – whether a religious celebrant, a family member, or a hired individual you found on the internet – is THE single most important vendor you will hire / work with. Located in Southern California & searching for the perfect wedding officiant? You can be in touch with Bethel & learn more about working with her here. Let her know that you heard her interview on the Wedding Planning Podcast! Bethel also authored an amazing book on how to create self-ordained ceremonies. (This is where you have chosen a brother, aunt, uncle, etc to marry you). You can visit American Marriage Ministries for more info. I hope you loved today’s show, and will share it with your favorite engaged couple!